Sierra Leone: Voting for Change or More of the Same? Sierra Leone - Can the 'Lion Mountain' Ever Roar Again? 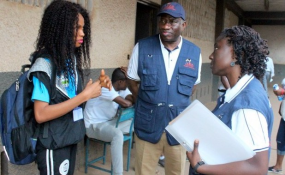 Former Nigerian president Goodluck Jonathan, leader of a mission observing the Sierra Leone polls sent by the Electoral Institute for Sustainable Democracy in Africa, visited polling stations in Freetown on March 7. There are calls for change across the West African country, but many people in regional areas continue to vote along traditional lines. Voting began in Sierra Leone early on Wednesday for the 2018 general elections, with over 3 million people expected to have their say on the country's president, parliament, local council members and mayors. President Ernest Bai Koroma, who cannot run again following two consecutive five-year terms, has positioned former Foreign Minister Sumura Kamara as his successor for the ruling All People's Conrgess (APC). The APC and the main opposition grouping, the Sierra Leone People's Party (SLPP), have dominated the country's political sphere since independence in 1961 -- but the new National Grand Coalition (NGC), headed by former UN diplomat Kandeh Yumkella, is shaking up the traditional two-party system by attempting to appeal to young urban voters in the capital Freetown. Almost 300,000 people are expected to cast their ballots in Sierra Leone's diamond-rich Kono district. Located about 400 kilometers (248 miles) away from Freetown, Kono is one of the least-developed regions in the country. Many locals are unhappy with the political establishment in the capital and are calling for change. "I want to see change in this country," Mariama Sheriff tolf DW, "Kono is not developed, I pray that the next president makes Kono a better place." "I am voting for change and development," said Uniser Sesay, "The things I have seen here are very pathetic. So I want someone who can take this country to a higher level -- someone who knows the constraints of the people, someone who knows their concerns." Although voting patterns have begun to shift in many other parts of the country, as debate increases on issues such as national welfare, in general Kono District locals continue to cast their ballots along tribal and regional lines. Former Vice President Samuel Sam-Sumana is from Kono District and enjoys a comfortable majority. The ruling APC party swept the district in the 2012 general elections, when Sam-Sumana was on the APC ticket alongside President Ernest Bai Koroma. Voter Sesay believes Sam-Sumana is the right man to represent his district. "He is the son of the soil and he knows the constraints of the people," Sesay told DW, "He knows every little thing in Kono District." The APC party lost support in Kono District after President Koroma removed Sam-Sumana as his deputy in 2015, prompting him to form and lead the new Coalition for Change (C4C) party. However, Sam-Sumana's chances of winning are relatively low, given his unpopularity in other parts of the country. In the sweltering 40-degree (104 degrees Fahrenheit) heat, tempers flared at the polling station in the town of Koidu in Kono District. Some voters complained that they had been standing in line since the early hours of the morning, but the polling station did not open until 8 a.m.
"I have been here since midnight," one man said, "I slept in that boat. The queue is not moving at all. Things are really slow here." Meanwhile, a mother lining up to vote told DW she had to make other arrangements for her children: "I left my home at 5 a.m. and have been here since then. I have children and I have to find food for them. I can't stand here until 3 p.m. When will my children eat? I want to vote right now." The officer in charge of that particular polling station, Kai Kondeh, conceded that confusion surrounding voter registration was the cause of the delays, but told DW that the voting process was later proceeding without a hitch. The polls were due to close at 1700 GMT, with partial tallies expected within at least 48 hours and full results within two weeks.